The focus of the colloquium will be on both observational and theoretical issues closely related to cosmic voids and the objects within them. Voids are perhaps the most salient feature of the spatial distribution of galaxies and occupy most of the volume of the present-epoch universe. While there have been many meetings focused on high density regions, there has hardly been a scientific meeting and/or conference on the lowest-density structures. A conference on voids is timely because current ongoing galaxy surveys such as the Sloan Digital Sky Survey (SDSS, see above), the 2-degree Field Galaxy Redshift Survey (2dFGRS) and the 2MASS redshift survey have accumulated samples that cover sufficient volume to accurately quantify the distribution of voids and the galaxies within them. Cosmology, the search for the origin, evolution and structure of our Universe, is at present experiencing a Golden Age. A search as old as human civilization itself seems to have produced a truly impressive understanding of the origin of our world. Not during any time before have we known such an accurate and compelling view of the cosmos and its constituents. We know its geometry is perfectly flat, we know it is 13.7 Gyr old, and we have learnt that its dynamics is dominated by an as yet unknown component of dark matter and an even more mysterious medium of dark energy driving its expansion into acceleration. Also we have come to understand the origin of structure in our Universe, with origins reaching back to the very first instances after the Big Bang. By meticulously mapping the tiny temperature variations in the cosmic microwave background we have obtained an unprecedentedly detailed view of the embryonic precursors of present-day Megaparsec structures. Major campaigns for mapping the galaxy distribution in our local Universe have revealed the existence of a salient foamlike cosmic web pervading throughout the visible Universe. The SDSS redshift survey map, after 3rd data release (movie following click). Courtesy: the Sloan Digital Sky Survey. The luminous galaxies which decorate the observed Universe beautifully delineate a space-filling foamlike pattern. An initial hint of this cosmic web was seen in the view of the local Universe offered by the first CfA redshift slice (de Lapparent, Geller & Huchra 1986). This view has recently been expanded dramatically to the grand vistas offered by the hundreds of thousands of galaxies in the 2dFGRS (Colless et al. 2003) and SDSS (Abazajian et al. 2003) galaxy redshift surveys. In the optical sky, galaxies are found in dense, compact clusters, in less dense filaments, and in sheetlike walls which surround vast, almost empty regions called "voids". Voids in the galaxy distribution account for about 95% of the total volume (see Kauffmann & Fairall 1991; El-Ad, Piran & da Costa 1996; El-Ad & Piran 1997; Hoyle & Vogeley 2002; Plionis & Basilakos 2002; Rojas et al. 2003). Around 1980 various studies pointed to the existence of large underdense regions in the galaxy distribution. Following indications by Gregory and Thompson (1978) of their existence, and subsequent discussions by Tarenghi et al. and Chincarini and Rood, the discovery of the void in Bootes in 1981 (Kirshner et al. 1981) marked the realization by the scientific community of the key role that voids play in the Megaparsec scale matter distribution. The Bootes void is a region 50h-1Mpc in diameter virtually devoid of any galaxies. The confirmation of the ubiquity of these structures by larger redshift surveys (Geller & Huchra 1989; da Costa et al. 1994; Shectman et al (1996) pose strong challenges for theorists to explain these structures (Peebles 2001) and for observers to survey for evidence of their contents. The formation history of voids is somewhat different from that of high-density regions (Sheth & van de Weygaert 2003) and therefore provides complementary tests of theories of large-scale structure formation. The interior of voids act like localized low density universes, thus the formation history of objects in voids tests our understanding of structure formation on small scales (e.g., Ostriker et al. 2003). Statistics of voids have been shown to be one of the strongest discriminants between galaxy halo models (Berlind & Weinberg 2002). Current ongoing galaxy surveys such as the Sloan Digital Sky Survey (SDSS) and the 2-degree Field Galaxy Redshift Survey (2dFGRS) are now accumulating samples that cover sufficient volume to accurately quantify the distribution of voids and the galaxies within them. Several groups are now or soon will be conducting analyses of voids in these surveys (Hoyle & Vogeley 2004; Croton et al. 2004) using a variety of statistical tools and techniques (El-Ad & Piran 1997; Hoyle & Vogeley 2002; Plionis & Basilakos 2002; Shandarin et al. 2003). Wider-area nearby surveys (CfA2, SSRS2, Optical Redshift Survey) are also being analyzed or re-analyzed for this purpose because they allow detailed examination of local voids and faint galaxies within them. There is strong need to bring together observers and theorists to synthesize approaches to studying voids that will yield accurate tests of models. Early analyses of these data reveal several critical issues regarding the nature of galaxy formation in voids (e.g., Rojas et al. 2003; Hoyle et al. 2004; Balogh et al. 2003, Kauffman et al. 2003). Related questions arise from recent blind HI surveys (Meyer et al. 2004, Giovanelli \& Haynes 2006) and absorption line studies that probe Lyman alpha clouds in voids and their relationship to galaxies (Penton, Stocke & Shull 2002; Manning 2002). At this time, several future surveys are under consideration which might probe voids at larger redshift, thus allowing study of the evolution of voids. In a void-based description of the evolution of the cosmic matter distribution, voids mark the transition scale at which density perturbations have decoupled from the Hubble flow and contracted into recognizable structural features, and voids act as the key organizing element for arranging matter concentrations into an all-pervasive cosmic network. As voids expand, matter is squeezed in between them, and sheets and filaments form the void boundaries (Icke 1984; Van de Weygaert 1991, 2002). This view is supported by Regos & Geller (1991), Dubinski et al. (1993), Van de Weygaert & Van Kampen (1993), Gottloeber et al. (2003) and Colberg et al. (2006), who describe how voids evolve in numerical simulations of gravitational clustering. 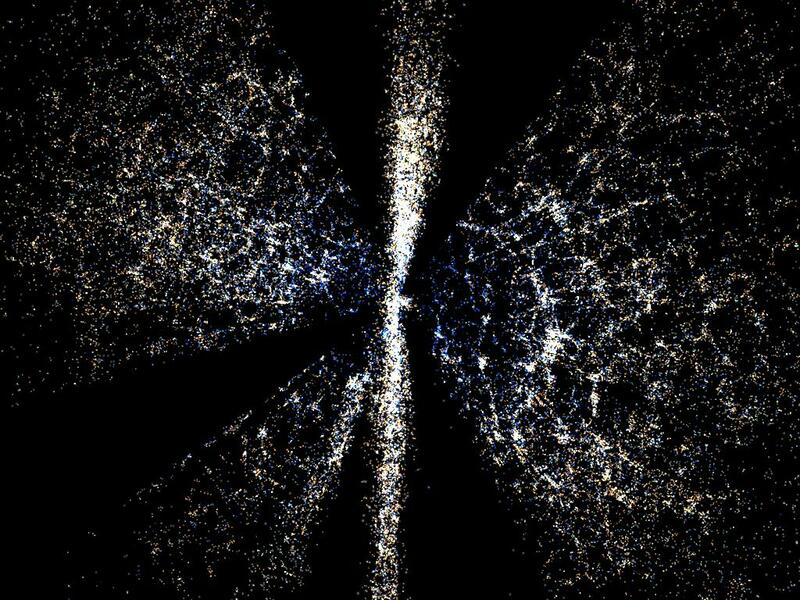 A void simulation, in a LCDM Universe. The simulation is based upon a CRF realization centered on an initial trough in the density field. Courtesy: Erwin Platen. The typical sizes of voids in the galaxy distribution depend on the galaxy population used to define the voids. Voids defined by galaxies brighter than a typical L* galaxy tend to have diameters of order 10-20h-1 Mpc, but voids associated with rare luminous galaxies can be considerably larger; diameters in the range of 20h-1-50h-1 Mpc are not uncommon (e.g. Hoyle & Vogeley 2002; Plionis & Basilakos 2002). These large sizes mean that only now are we beginning to probe a sufficiently large cosmological volume to allow meaningful statistical studies of voids. As a result, the observations are presently ahead of the theory. For example, the observed scaling of void size with luminosity is now quite precisely quantified (Arbabi-Bidgoli & Muller 2002), but the physical reasons for it are not well understood. Presumably the observed scaling is a consequence of two effects: the number density of luminous galaxies decreases exponentially with increasing luminosity (e.g. Schechter 1976); and galaxies cluster, with clustering strength increasing with luminosity (e.g. Hamilton 1988; Tegmark et al. 2004). In addition, the possibility that void galaxies are a systematically different population has received considerable attention in recent years (Szomoru et al. 1996; El-Ad & Piran 2000; Peebles 2001; Rojas et al. 2003). A clear picture of the relation between void galaxies and their surroundings is only just becoming available, but again, there is little understanding of the physics which drives the observed correlations. The simplest models of biased galaxy formation (e.g. Little & Weinberg 1994) predict that voids would be filled with galaxies of low luminosity, or galaxies of some other uncommon nature (e.g. Hoffman, Silk & Wyse 1992). More sophisticated models have recently been developed (Mathis & White 2002; Benson et al. 2003, Hoeft et al. 2003); in these models the properties of galaxies are determined by the halosthey inhabit. Therefore, if one can model the halo population associated with voids, a model of the void galaxy population is within reach. A related challenge is to develop a physically motivated model for if and how low density environments influence galaxy formation. 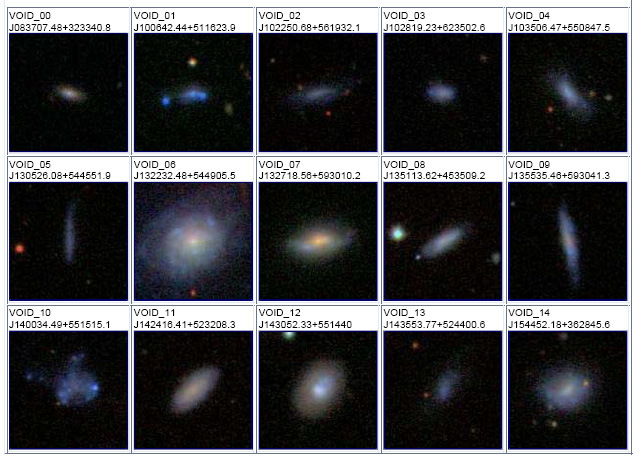 A sample of fifteen void galaxies selected from the SDSS redshift survey. Courtesy: Miguel Aragon, Erwin Platen & Katharina Kovac. Because voids are so large, they potentially provide probes of the primordial power spectrum on scales which have traditionally been studied using peculiar velocities. Moreover, the scaling of void size with galaxy luminosity, and the expected influence of environment on galaxy formation, depend on the background cosmology.